Workforce Unlimited Premier Division leaders Pointon were beaten 5-1 at home by Railway Athletic. Railway were 3-0 ahead by the interval, Pointon pulling one back through Ian Jacquest before the away side added to their tally. Coningsby beat Spilsby Town 6-2, their goals coming from Tom Sewell (three), Shaun Boothby (two) and Ben Brown. Benington and Leverton shared the points in a 3-3 draw while Ruskington Rovers won 3-1 at Old Leake, Liam Tait (two) and Wes Greenwood on target while Leake’s consolation came from Ashley Jackson. 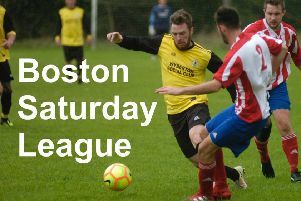 In Division One, Horncastle Town Reserves thrashed basement side Pointon Reserves 9-2, while goals from Greg Brown (three) and Victor Sibert (two) saw Friskney beat Boston College 5-3. Old Doningtonians left Woodhall Spa United with a 4-0 win. In Division Two, FC Hammers kept the pressure on leaders Fosdyke with a 5-0 away win at Holbeach Bank, while Park United dropped points away at Coningsby Reserves in a 2-2 draw, Neil Allen and Jordon Brader on target for Park. Digby found it hard going when they visited Northgate Olympic in Division Three, losing 4-0. Fosdyke Reserves took all the points when they beat Leverton Reserves 5-0, goals coming from Reece Lovelace (three), Jack McMeechan and an own goal.